projected 35mm slide sequence of 288 images, four slide projectors, control system. Twelve by Twelve by Two is a projected 35mm slide work consisting of twelve sets of twenty four images. Each set depicts a particular subject or typology of what the artist terms ready-made images that variously encompass his ongoing photographic studies, collections, unrealised projects, fragments of earlier artworks, and self-reflexive stagings of the photographic medium itself. Four slide projectors are programmed to create twelve systematic sequences of superimposed images, each of approximately two minutes duration that include pictures of uninhabited zoo environments, seascapes, hand gestures, projection lamps, instructional pictures, renderings of a speculative sculpture project, a study of photographic images found on empty buildings and sites, a collection of mid-century glassware, an issue of an art magazine from 1971, encyclopaedia photographs with holes, and a study of raking and flying shores. The contingency of the material is re-imagined and re-constituted through tropes of superimposition, seriality and the grid that draw on the legacies of Structural film and the procedural logics of minimalism, early conceptual art and twelve tone serial music. This work was exhibited as part of the solo exhibition Efference Copy Mechanism, at Temple Bar Gallery + Studios, 14 Feburary- 13 April 2019. 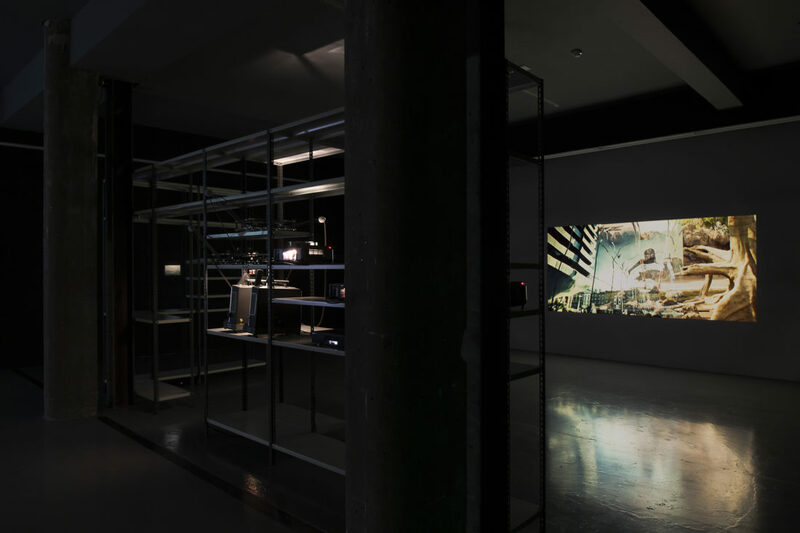 The exhibition comprises a complex arrangement of superimposed slide and 16mm film projections that draw on the artist’s personal archive and accumulated image bank, continuing his ongoing exploration of celluloid materiality, appropriated and found images, instructional film and pedagogy, reproduction and indexicality.